Whether or not they realise it, the Kings and Queens of this world are on the front line. That is simply how it is. Kings certainly do not desert their men in battle and Queens are quite capable of managing their domains from the front, too. That means they do not desert their men, either. In an ideal situation all the men of the Kings would unite with all the men of the Queens and together they would not only be a more effective line of defence, they would perhaps see in one another’s eyes that their objective is ultimately one and the same, i.e. it is a common one. 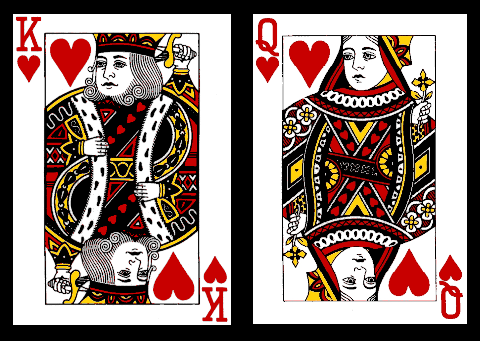 Kings and Queens – in the traditional manner – are elevated to their status because they have the wherewithal to handle the weight of such a title. Being a King or a Queen is not part of being in a fairytale. It is a very serious business. The Kings and Queens that turn up thinking their job is a picnic are soon deposed. That is called Natural selection. A King is denoted by his honour, his word. A Queen is denoted by her honour in combat and her determination. In this, they have equal power. In the royal enclave there are such things as Kingcesses. Those who can identify upon sight a Kingcess are fortunate. He who catches a Kingcess is a lucky man – it is like finding an angel flying on solid ground. That – like being struck by lightning – is not a common occurrence. In fact, it happens only once in two blue moons.